The colours of the Devonshire and Dorset regiment have been laid up. The regiment, which has about 650 men, is to become the 1st Battalion of the army's new larger light division called The Rifles from February. The move is part of an Army reorganisation which was first announced in 2004. 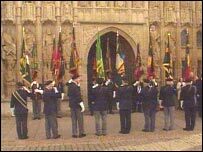 The colours were laid up in the regimental chapel at Exeter Cathedral after a parade through the city. The chapel will be their permanent home. The Army said the formation of The Rifles would create the biggest infantry regiment in the force. It is being formed from the merger of the Devonshire and Dorset Light Infantry with The Light Infantry, The Royal Gloucestershire, Berkshire and Wiltshire Light Infantry, and The Royal Green Jackets. It means the Devon and Dorset colours, including the standards of their regiment and all the cap badges and uniforms, will no longer be worn. Troops, veterans and cadets paraded through Exeter city centre on Saturday before bringing the colours to the cathedral. Its current colours were dedicated in 2001. 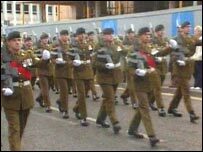 The regiment was formed in 1958 in Germany after the amalgamation of the Devonshire Regiment and the Dorset Regiment. Both the former county regiments had histories going back hundreds of years. The Devonshire Regiment was raised in Bristol in 1685, later fighting with King William III at the Battle of the Boyne in 1690. The Dorsets was raised in Ireland in 1892. Deployments of the Devonshire and Dorset regiment in recent years included Northern Ireland and Bosnia. Some troops have also recently served in Iraq.